Year 2014 was important, and its Remembrance Day had to be equally important as it was to be the Centenary of the First World War. It was a hundred years ago that the mankind in modern era tasted the conflict of a grand scale. A war that was waged across continents and whose effects were to linger on physically and more deeply on the emotional front. A war that drew major economic powers of its times into a conflict, conflict that is very much the human nature. A war that eventually shaped up the new maps across Europe and Middle East. With over nine million military and a little over one million civilian casualty figures the Great War significantly transformed the socio political and economic course of the twentieth century and paved the way to the second great war; WWII. Undivided India being a colonial part of the British Empire got on its plate a remarkable contribution to His Majesty’s War Effort. A little over a million manpower was contributed of which nearly eight hundred thousand were the army troops. 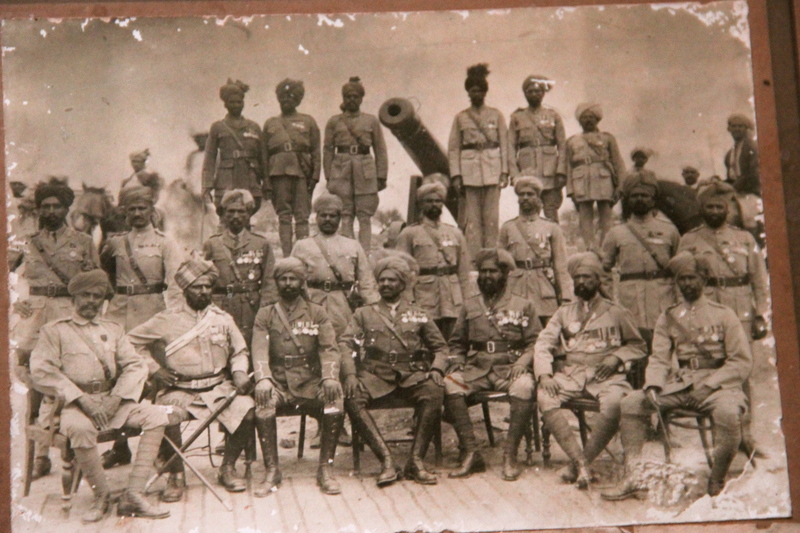 Men in arms from India fought on all major fronts including Europe, Middle East and Africa. With contributions at that mega scale there were numerous feats of gallantry, of valiant fighting, of lives lost, the medals won and the legacy of Natives winning the Victoria Cross (Britain’s highest military decoration for valour). These contributions when narrowed down to their places of origin have some magnificent stories to tell. 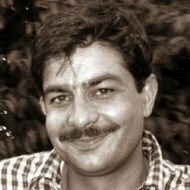 May it be Dab of Khudadad Khan, Tirah of Mir Dast, Takhti of Shahamad Khan or “The Village with the Gun”, all have tales and relics though frosted under sands of time but do unveil their glory to the one who heads out to discover. 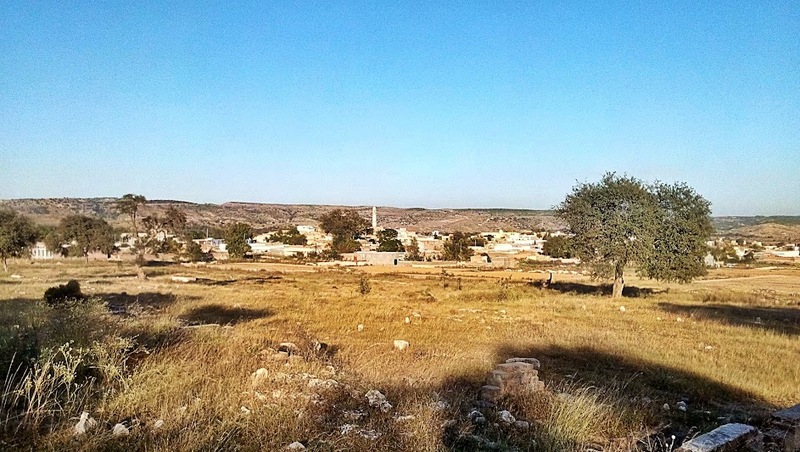 Dulmial, dear reader, is a place of no apparent significance that is encountered on an off-shoot from Kallar Kahar – Choa Saiden Shah Road. 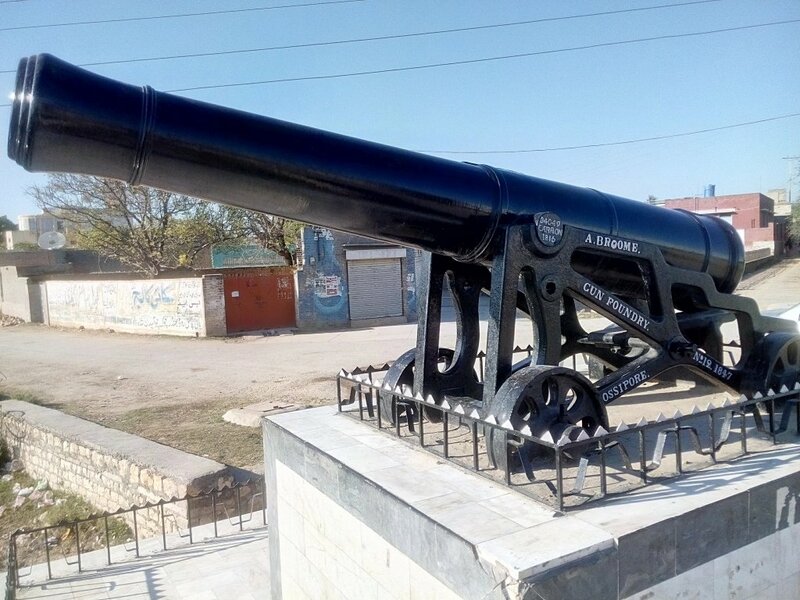 A village of Chakwal District, when explored unravels a gem within its confines; a 19th century English Cannon on display, jet black and shining under the blue skies, making Dulmial “The Village with the Gun”. It was a glare from that beautiful Artillery piece that attracted my eye in Islamabad, as I was reading through a newspaper article in relation to the Centenary Commemorations of the Great War. The contents of the article had some interesting facts to disclose and I had immediately decided to stop by the very next available opportunity. Where else to go to capture the true flavor of the Great War other than the village with the singular honour of the most contributions to WWI in the entire sub-continent, 460 men to be specific of which 9 never made it back home. I had three landmarks registered on the hand annotated map as having entered Dulmial, I asked a village local about their locations on ground. I got directed to the village pond almost in the center and there was the first one. On a marble platform of around 5-6 ft height, was this low railing housing a 12 Pounder Artillery Gun, polished black majestically shining under the bright rays of the overhead sun. The cannon was originally cast in Scotland at Carron Ironworks in the year 1816. The carriage of the piece bears some written references to include A.Broome, Cossipore, 1847. The crossword puzzle once gets deciphered reveals that this stand, dear reader, was made in India at Cossipore Gun Foundry under Captain A.Broome in the year 1847. Cossipore (Kashipur) is in northern Kolkata (erstwhile Calcutta) where this Gun and Shell Factory is the oldest one surviving in the sub-continent. This 12 pounder artillery piece, of which we had gone into the details tracing the origins, was awarded by the British Government in recognition of Dulmial’s contribution to the war effort. 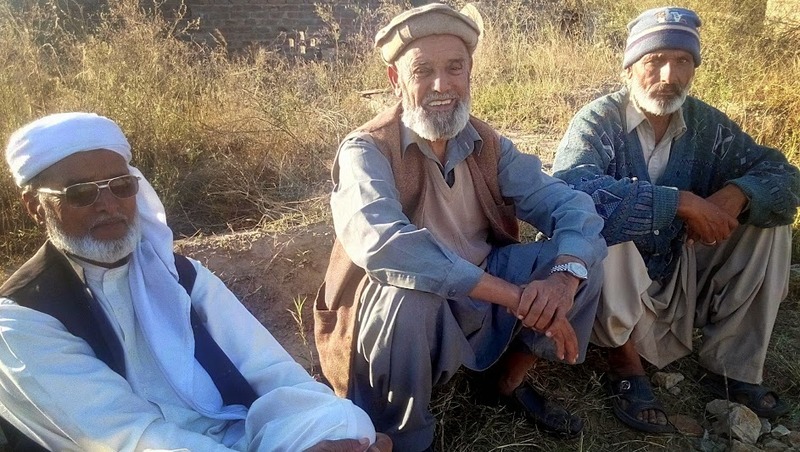 The legend has it that the village elders were asked a present of their choice and the committee headed by one Sardar Bahadur Captain Ghulam Muhammad, a native of Dulmial and a distinguished and decorated soldier of British Army chose to be awarded with the said Artillery Gun. Moved from Jhelum to land in Dulmial, the transportation of the gun is an interesting story that involves railways as well as the bull-carts, the details of which can be referenced here. This Artillery piece was ceremoniously received by a group of soldiers from Dulmial who were on active service in British Army and the year, dear reader, was 1925. There is a nice group photograph of these men with the received prize. The second landmark on the cards was the WWI memorial to commemorate the contribution to the war effort. Typically as found in the numerous villages of the sub-continent, it’s an obelisk of square cross section mostly erected of red burnt bricks, around 7-8 feet high with a narrow tapered square top (not a pyramid top as literally is on an obelisk). A white marble slab affixed on one of the sides bears in engraved words the announcement for which the memorial was erected in place. This monument at Dulmial was obscured within the boundary walls of the Primary Section of Government High School. The slab in engraved words (painted black to fresh up the engraving) bore the name of the village Dulmial followed by the Royal cypher “G.R.I” that stands for George Rex Imperator (the Latin term for George V King Emperor) underneath which it announced the contribution to war effort as 460 men (reportedly largest figure from any single village in the sub-continent) and the number of people who lost their lives as 9. I had earlier come across one such monument at Takhti (a village in Rawat suburbs) and another one was reported to me by a friend Noor Rauf Rathore in the neighborhood of Chak Shehzad in Islamabad. It was Noor to point out that hexagonal symbol (Star of David) embossed on the marble slate. Here at the Dulmial monument, two hexagonal stars with a nine petal flower etched inside each reside on the top corners of the embossed arch within which the engraved “Contribution Statement” resides. Interestingly I could not find a direct association of a Six Pointed Star with the Great War. Having gone through some references the only plausible connection I could find was with a military symbol that traditionally has been in use in British (and US as well) military swords; six pointed star formed by interlocking triangles as a mark of ‘proved’ or ‘approved’. To fancy the imagination it might be taken as a poppy flower housed within the Star of David, but that would be far from reality. The mystery of the symbol with the star and the flower etched within, dear reader, stays till a fateful day when it gets deciphered. Before moving onto the third landmark, I got directed to the house of Subedar Fateh Muhammad, a veteran of WWI who had died back in 1958. It was here that a makeshift museum was reported and I immediately opted for a sneak peek into the relics from the past. I was greeted by his grandson and was afforded a visit to the museum that in fact was the drawing room of the house. 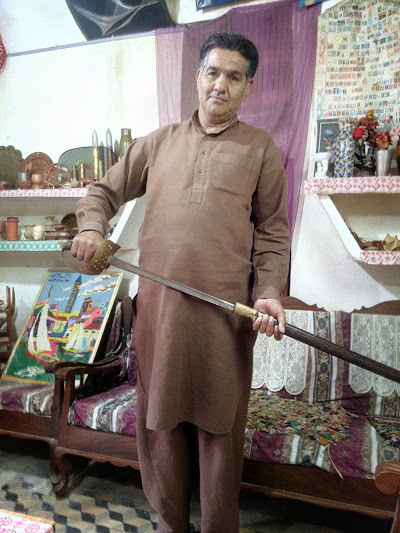 I expected to discover some soldierly possessions of Subedar Fateh Muhammad of which there was this ceremonial sword and a pith helmet (sola hat) carried by the soldier in good old times. There was this photograph of the Soldiers’ group with the 12 Pounder Artillery Gun on the day of its receiving at Dulmial in 1925. The other items in the collection were not related to military but included ancient household items recovered from the old settlements in the village. There was this pottery, some wooden craft and other associated finds. Interestingly I came across these fossils of sea shells that I was told were recovered from Salt Range and dated back to thousands of years when the area was flooded with waters with the pointed peaks and deep ravines of the salt range peacefully camouflaged in the sea-bed. I did appreciate the painstaking work undertaken over the years for these collectibles and above all the traditional hospitality of Subedar Fateh Muhammad’s household with which I was accommodated having abruptly turned up at the doorstep without any prior intimation. Having visited the landmark sites and the relics at the museum, dear reader, it was time… time to be in audience with the war veterans, the ones whose glory brought the laurels to this far flung village in the Potohar stretch and whose legacy goes on in the military contributions to date from the village of Dulmial. To pay my homage and to say those silent and brief words of gratitude I was in Dulmial graveyard. A piece of land so richly inhabited by nothing but the traits of valour, chivalry and sacrifice. As I was to embrace the veterans now dead for decades, there was this trio of the living ones sitting under the shady trees perhaps reliving the past glory in their conversation. The rays from the setting sun reflected from their shiny faces and their eyes twinkled to find the one who was from them. I met with the retired soldiers each from Baloch, Artillery and EME Corps of Pak Army and having exchanged the introductions I was extended the ownership that derives its routes from the purity of Espirit de Corps. For the remaining evening I was part of them as they were part of me as we conversed on variety of subjects starting from the good old military traditions, the glory of Dulmial and the war veterans that lay buried around us. I was afforded a guided tour through the graves of the soldiers. We visited Sardar Bahadur Captain Ghulam Muhammad, Subedar Fateh Muhammad and a lot many others. WWI and II remain my favourite period in world history (perhaps I watched way too many war movies). Anything associated with them is delightful. Just as this post was. You keep raising my expectations. As for the unknown memorial in Rehara (near Chak Shehzad), that’s still a mystery. I wrote to several authorities, they say it’s out of their “jurisdiction”. Hopefully, some day soon, this puzzle will be solved as well. Movies and books on the two wars carry a variety of flavors and highlight a number of aspects other than just fighting. I am amazed how something as horrible as war does get fantasized through our perceptions. It’s been a favorite period in world history with me as well. Thank you for admiring the effort.